Funnels are one of the most useful tools in both the kitchen and the garage. Elegantly simple, they utilize a cone shape to more easily channel fluids and granular substances into small openings. They consolidate something that might otherwise be pretty unwieldy into a smooth, pinpoint stream. 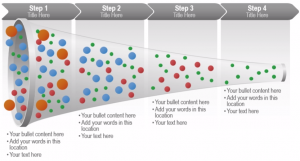 Many funnels also include some sort of sifting or filtering component, doing everything described above, while also making sure that some of the input is left behind. All of these properties make the funnel not only a great practical tool but also a handy visual metaphor. That’s why we have over 350 funnel graphics in our library. Here’s just a few that you can use to illustrate consolidation, efficiency, refinement, or a myriad of other principles, both metaphorical and literal. This graphic illustrates the many components and processes that influence a project. 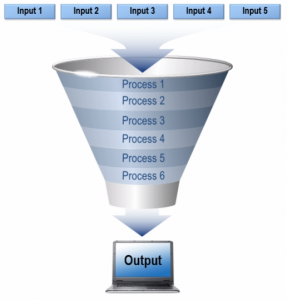 Notice how 5 separate inputs enter the mouth of the funnel and undergo several processes before coming out the other side as something else entirely. 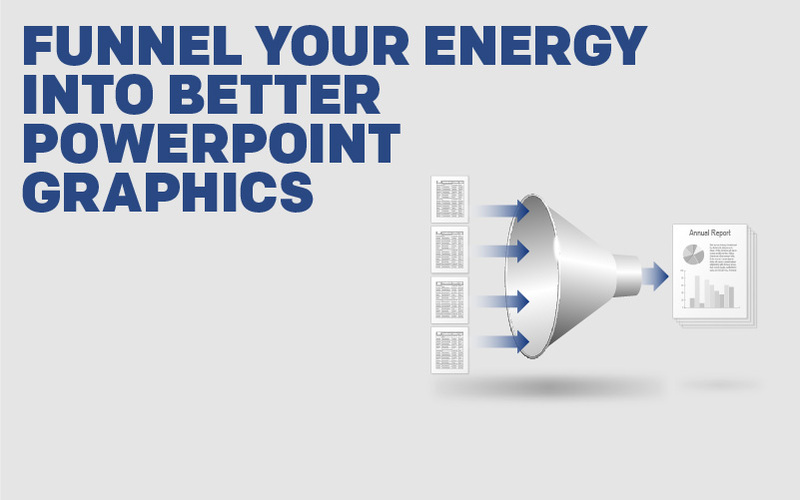 Taking these PowerPoint graphics at face value, your company might develop computers. Running with that theme, the inputs could all be features that set your computer apart from others (50 TB hard drive, waterproof, built-in toaster oven, etc.). The processes are the steps and changes that need to be addressed to make the project happen (lock your computer engineers in a room until they figure out how to fit 50 terabytes of data on the tip of needle, dip circuits in liquid rubber, learn how to violate the laws of thermodynamics so you can attach a toaster oven to a computer without it overheating, etc.). And voilà, on the other side you have the output, which in this case is one slammin’ computer. Notice how this mélange of disparate particles enters the large end of this funnel and incrementally gets separated into its component parts by the time it reaches the small end, from the large orange pieces, all the way down to tiny greens. Each step removes a certain piece from the mix, much like a real life water treatment works. (A skimmer removes the larger objects, reverse osmosis removes these impurities, distillation gets rid of those, etc.) If you so desire you might use this graphic to portray a simplified version of that exact process, or if you want to go a little more metaphorical with it, you might use it to illustrate the hiring process of your company, “separating the wheat from the chaff” as it were. Funnels can also work in reverse. Megaphones can create a deafening sound by sending sound waves through the small end, directing the sound into a more focused direction. Modern megaphones utilize this principle and add a little electronic help, creating a loud and sharp sound if you are standing in its path. 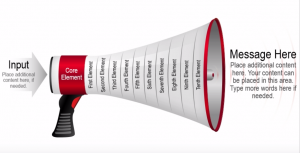 This graphic uses the megaphone as a metaphor for how communication occurs. Information goes in at the microphone side of the megaphone. As the info travels through the device, it gets consolidated into one central message, which is then modified and amplified by process that follows, before the actual message that everyone hears comes out the other end, something created and refined by the processed inputs that initially started everything. You can find these and many other amazing graphics for your next PowerPoint presentation in our PowerPoint graphic library. Download today!